Skydome Skylight Systems has introduced a new skylight design that addresses the brief for ‘style, function and versatility’. The new glazed segmented skylight was created by Skydome’s production team by etching a design onto the glazed panels that mirrored the fabric design used in the space below, resulting in an attractive and functional natural lighting feature for the entry way. Sydney-based interior designer Danielle Dunsford from dbdesigns, who recently inspected the new-style skylight installed at an inner-city residential project, described the effect of the glazed segment skylight as ‘quite spectacular’. According to Danielle, the shadow of the design etched onto the glass moves over the space below depending on the sun's position, creating a dramatic design statement. Skydome's glazed segmented skylight was built to specification using sections of curved heat strengthened laminated glass sections 11.76mm thick and measuring 1800mm in diameter. Skydome’s latest range of glazed segmented skylights is available in a choice of two circular styles and a truncated cone-shaped model for residential as well as commercial applications. 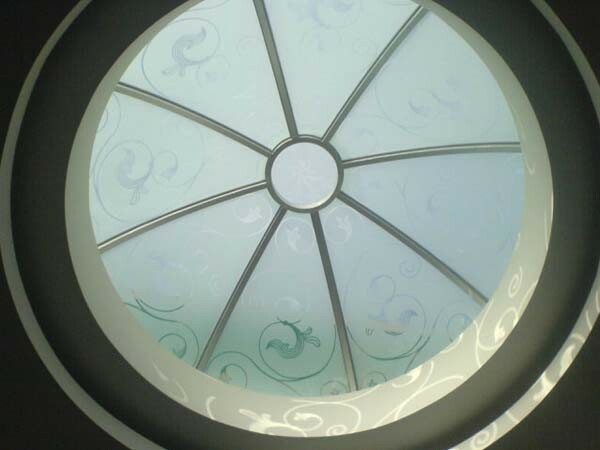 The skylight's glazing can be clear, tinted or sandblasted to any design. The lightweight, yet extremely strong extruded aluminium framing system can also be powder-coated to match any interior or exterior colour palette. For commercial installations, Skydome's glazed segmented skylights can be supplied in diameters of up to 3.4 metres. According to Michael Bonello of Skydome Skylight Systems, the new segmented skylight range gives designers and architects a greater selection of natural lighting solutions as well as room for more creativity. He adds that the new skylights have tremendous aesthetic appeal and design flexibility, enabling greater design freedom when natural light is being used as an adjunct to the design concept.